What are the best methods for becoming healthy and fit? Most people and experts would tell us the well-known combination of eating the right food in the right portions and regular physical activity. In addition to that, we need to avoid unhealthy habits like smoking (of course). 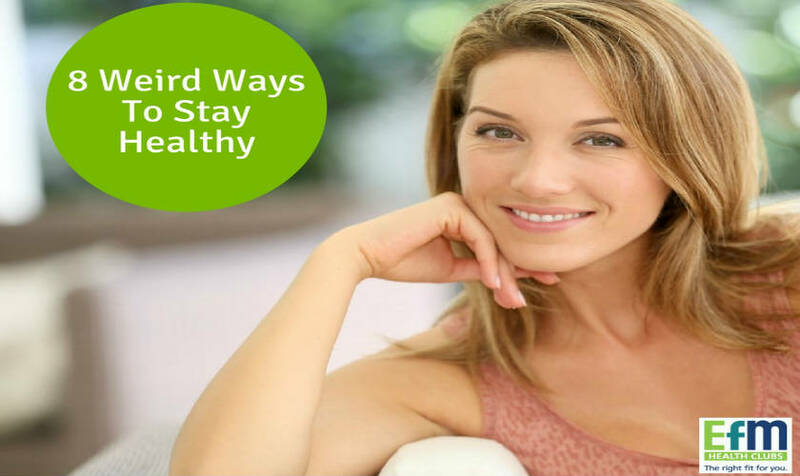 However, there are also some unusual tips you can follow that can benefit your health. Read on! 8 Slightly Odd Ways To Stay Healthy! Most of us like listening to music. Research shows, however, that listening to music does not just make us feel good… Music also has a beneficial effect on the brain, maintaining memory and brain function even as we age. It can relax us and lessen feelings of anxiety as well. Though drinking too much coffee can have harmful effects on the body, sticking to a cup or two per day is actually good for our health. Aside from providing us with energy, it aids in burning fat and calories by raising our metabolism slightly. The positive effects of laughter can be seen on both our minds and bodies. Laughing helps us cope with stress. In addition to that, it increases our circulation and helps lower blood pressure levels. It also aids in relieving aches and pains in the muscles believe it or not! Red wine also contains a good amount of antioxidants and other nutrients. It can lower cholesterol levels and aside from that, it strengthens the heart to reduce the risk of cardiovascular conditions. These antioxidants also have a role in fortifying our immune system. Singing is always fun and here are a few other reasons to make you want to sing more. Singing can help uplift our mood and decrease tension. This makes singing an excellent way to manage stress, which is good for our heart, for improving our immune system and for our overall health. One alternative to red wine, if you’re avoiding alcoholic drinks, is dark grape juice. Antioxidants aplenty can also be found in dark grape juice, making this drink helpful for decreasing cholesterol levels, regulating your blood pressure and protecting the heart from disease. According to many studies, having friends and nurturing those friendships can increase our life span. This could be because talking to friends and spending time with them relieve us of stress. Our buddies also influence us, whether it’s for good or bad. Friends who share the same health goals, for example, usually motivate each other to stay healthy. Including flossing in your daily oral health routine removes stubborn bacteria that comes from food particles caught in between teeth. When these bacteria flourish in the mouth, they cause tooth decay and gum disease and contribute to other diseases like diabetes, kidney problems and pneumonia – yikes!